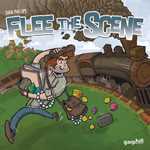 Flee The Scene is a fast-paced game of robbing museums across the Mediterranean. Players use trains, trucks and ships to steal antiquities and fence them off. Players can carry only three antiquities at a time and must optimize their movement to edge ahead of the competition. The aim of Flee the Scene is to steal and deliver the most rewarding antiques before the time runs out. Each delivered antiquity scores points. Once 1 player scores 13 or more points, all other players have 1 last turn before the game ends. The player with the highest score is the winner!